Individuals with a Master's in Finance degree enter a variety of professions which require them to navigate the world of complicated financial instruments and regulatory requirements. Just about every industry, including nonprofits and government agencies, need qualified, well-trained financial professionals. Companies seek financial professionals who can minimize risk, diversify financial portfolios, maximize return on investments, and help the company grow. A Master's in Finance degree signifies an individual possesses unique knowledge in the field of finance above and beyond someone who may hold an MBA or similar business degree. Online Master's in Finance degree programs allow students of all backgrounds, including busy professionals, to earn the education they need for greater success in the business world. What is a Master's in Finance Degree? A Master's in Finance Degree provides students with the advanced graduate education necessary to pursue a diverse array of professions in finance. Students typically engage in core coursework that covers fundamental aspects of finance, such as financial market analysis, portfolio management, and corporate finance, alongside elective coursework that delves into niche areas, sometimes with options for specialization or hands-on learning through internship opportunities. Students in Master's in Finance programs typically learn quantitative skills to evaluate financial information, make financial decisions, choose and evaluate portfolios, and manage risk. Students learn to apply financial strategies to real-world business issues. How long does it take to complete an online Master in Finance degree program? Some of the programs allow full-time students to complete the program in 12 to 16 months, and 24 months for part-time students. What kind of job can someone with a Master's in Finance get? How much does someone with a Master's degree in Finance make? Is Finance a growing job field? What is the difference between a Master's degree in Finance and a MBA in Finance? Are there professional associations for someone with a degree in Finance? Indiana University – Kelley School of Business ranks #1 among The Best Online Master's in Finance Degree Programs! The Kelley School of Business at Indiana University provides undergraduate and graduate program options through eight different departments representing diverse fields, including Accounting, Business Law and Ethics, Management and Entrepreneurship, and Finance. The Kelley School of Business can trace its origins back to a political economy course offered in 1830, establishing a long tradition of business education. With internship and scholarship opportunities, professional partnerships, and on-campus centers and institutes such as the Center for Econometric Model Research, the Kelley School of Business has plenty to offer toward the professional success of its students. The Department of Finance's online Master of Science in Finance degree program prepares students for a variety of careers in finance. The curriculum emphasizes key aspects of finance professions, developing a balanced foundation of knowledge of theoretical and practical approaches to finance. Students gain a thorough understanding of financial management, quantitative analysis, value creation, economics, risk management, capital markets, and more. Students in the program enhance their ability to pursue careers such as financial analyst, insurance underwriter, auditor, and budget analysis. Students must complete a brief on-campus residence at the beginning of the program. Students can complete the program in 15 months. Students can combine the online MS in Finance degree program with an MBA program for a dual-degree option. Indiana University is accredited by the Higher Learning Commission (HLC). The Kelley School of Business is accredited by the Association to Advance Collegiate Schools of Business (AACSB). Penn State World Campus ranks #2 among The Best Online Master's in Finance Degree Programs! Penn State World Campus, the online campus of Pennsylvania State University launched in 1998, enrolls almost 18,000 students in a wide variety of undergraduate, graduate, and professional degree and non-degree programs. In keeping with Pennsylvania State University's long history with distance education (since 1892), Penn State World Campus offers the same educational quality online as the on-campus programs of Pennsylvania State University, a member of the Association of American Universities (AAU). Penn State World Campus offers an online Master of Finance degree program that prepares students to pursue careers in finance in a variety of professional settings. The program provides a strong foundation of theoretical and practical knowledge and skills. Coursework utilizes a fixed schedule and covers key subjects, such as market analysis, speculative markets, portfolio management theory, research in security valuation, and more. Students enhance their ability to fill a variety of professional roles, such as mutual fund manager, financial analyst, financial risk manager, and corporate finance officer. Students in the online program must complete a capstone project, as well as a four-day on-campus residency. Penn State World Campus is accredited by the Middle States Commission on Higher Education (MSCHE). The online Master of Finance degree program is accredited by the Association to Advance Collegiate Schools of Business (AACSB). Northeastern University – D'Amore-McKim School of Business ranks #3 among The Best Online Master's in Finance Degree Programs! The D'Amore-McKim School of Business at Northeastern University provides a wide variety of undergraduate and graduate program options. The School's Professional Partnerships and engagement in the business community provide unique learning and networking opportunities for students. The school participates in research and outreach through several centers and institutes, including the Center for Workplace Analytics and the Center for Family Business. The D'Amore-McKim School of Business offers an online Master of Science in Finance degree program with two track options in Corporate Finance and Investment Finance. The program couples a wide knowledge base with field-specific focus. Students develop theoretical and practical knowledge in fundamental areas such as market analysis, investment analysis, investment banking, corporate finance, risk assessment and management, and more. Students prepare to pursue a variety of careers in finance, such as risk manager, senior financial analyst, investment banker, corporate finance officer, and more. Students can complete the online MS in Finance program in 16 months with continuous study. Students may also pursue a dual degree MBA/MS in Finance program. Loyola University Chicago – Quinlan School of Business ranks #4 among The Best Online Master's in Finance Degree Programs! The Quinlan School of Business at Loyola University Chicago builds on the Jesuit mission and values of the university to provide quality business education grounded in experiential learning and service. The School provides undergraduate and graduate programs spanning diverse fields of study in business, including sport management, entrepreneurship, and finance. Students benefit from professional partnerships, internship and scholarship opportunities, career development services, and centers and institutes such as the Center for Risk Management. The Quinlan School of Business offers an online Master of Science in Finance degree program with three track options in Corporate Finance, Asset Management, and Risk Management. The program features a STEM designation, due to its technical approach to complex finance problem-solving, giving students a unique edge in the field. The online MSF program develops a strong foundation in key aspects of finance, including risk management, investment, ethics, and financial modeling. With professional partnerships, the program offers networking and experiential learning opportunities for students. Students prepare to pursue a wide variety of careers in finance through developing general and niche skills and knowledge. Students in the program must complete a capstone project. Students can complete the online MSF program in 12--15 months of full-time study. Loyola University Chicago is accredited by the Higher Learning Commission (HLC). The Quinlan School of Business is accredited by the Association to Advance Collegiate Schools of Business (AACSB). Drexel University – LeBow College of Business ranks #5 among The Best Online Master's in Finance Degree Programs! The LeBow College of Business at Drexel University provides students with a variety of undergraduate and graduate program options. The LeBow College of Business emphasizes a core commitment to maintaining contemporary, relevant knowledge in the field, integrating new developments and innovation in business to keep students on the cutting edge. With a large professional network, student organizations, internship, study abroad, and scholarship opportunities, and research centers, the College provides students with the necessary resources for their professional success. The LeBow College of Business offers a Master of Science in Finance online degree program that develops a strong foundation of knowledge and skills. The program emphasizes finance fundamentals, including statistical analysis, corporate finance, a thorough understanding of the current business environment and market, forecasting and prediction, risk management, and more. Students prepare to pursue a variety of careers in finance, including investment banking, hedge fund management, portfolio management, market analysis, and more. Students can complete the online MS in Finance degree program in 24 months with a break between years one and two. University of Miami – School of Business Administration ranks #6 among The Best Online Master's in Finance Degree Programs! Dating back to 1929, the School of Business Administration at the University of Miami offers a substantial history of tradition and experience in business education. With a variety of undergraduate and graduate programs covering such areas as business administration, entrepreneurship, and finance, as well as on-campus and online options, the School of Business Administration meets the needs of a diverse body of students. Through internship, study abroad, and scholarship opportunities, student organizations, professional networking, and experiential learning opportunities such as the student managed investment fund, the School of Business Administration maintains a commitment to the professional success of its students. Through the UOnline platform, the School of Business Administration offers a Master of Science in Finance online degree program that prepares students to pursue a variety of financial careers. The program utilizes a fixed course sequence to cover foundational and advanced knowledge and skills necessary to professional success. Through eight courses, students develop an understanding and working knowledge of key aspects of finance, including corporate finance, international investments, financial modeling, portfolio management, and more. Students can gain skills and knowledge particularly suited for careers in investment finance, such as financial analyst, commercial banker, money manager, hedge fund manager, private equity specialist, and investment banker. Students can complete the online Master's degree in Finance in 16 months. Students may earn certificates with additional coursework. 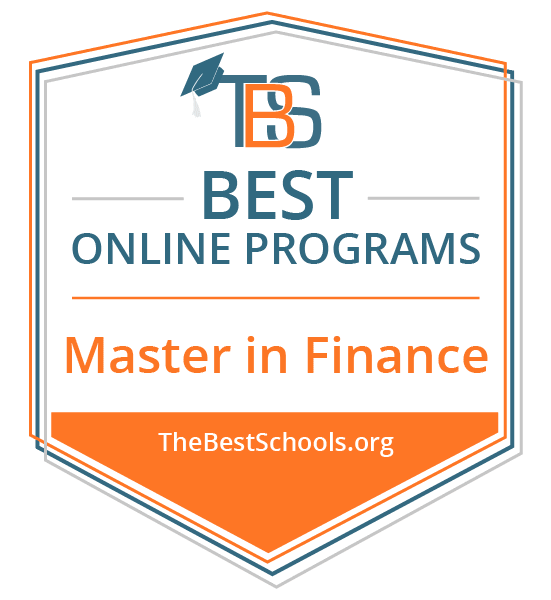 Auburn University – Raymond J. Harbert College of Business ranks #7 among The Best Online Master's in Finance Degree Programs! Founded in 1967, the Raymond J. Harbert College of Business at Auburn University offers undergraduate and graduate programs across diverse fields represented by five different departments, including the Department of Finance. Maintaining a dedication to the professional success of its students, the College offers internship and scholarship opportunities, student organizations, networking events, and a variety of research centers, including the Center for Ethical Organizational Cultures. The Department of Finance offers an online Master of Science in Finance degree program with thesis and non-thesis options for completion. The program emphasizes a balanced foundation in theoretical and practical approaches to finance, with plenty of options for focused study through elective coursework. Students develop knowledge of financial analysis, risk and return assessment, finance in various fields and settings, applied financial management, and more. Students prepare to pursue a variety of financial careers, including securities analysis, investment banking, insurance, international financial management, and more. Auburn also offers an MBA / master's in finance dual degree program. Auburn University is accredited by the Southern Association of Colleges and Schools Commission on Colleges (SACSCOC). The Harbert College of Business is accredited by the Association to Advance Collegiate Schools of Business (AACSB). Boston University – Metropolitan College ranks #8 among The Best Online Master's in Finance Degree Programs! Founded in 1965 as the Division of Continuing Education, the Metropolitan College at Boston University has years of experience in meeting the educational needs of non-traditional students through distance and part-time programs. Providing undergraduate and graduate degree and non-degree programs across a diverse array of fields, Metropolitan College allows busy non-traditional students to earn the advance education they seek. Metropolitan College provides a Master of Science in Financial Management online degree with two concentration options in International Finance and Investment Analysis. The program emphasizes fundamental and advanced knowledge and skills in finance. Students develop an understanding of risk-reward analysis, ethical decision-making and critical-thinking skills, quantitative approaches to financial and market analysis, contemporary regulatory environment trends and factors, and more. Students prepare to pursue financial careers in a variety of professional settings, including corporate finance, financial management, and multinational finance. Students can complete the online program in 18--24 months. Boston University is accredited by the New England Association of Schools and Colleges (NEASC). The Metropolitan College is accredited by the Association to Advance Collegiate Schools of Business (AACSB). University of Massachusetts, Lowell – Manning School of Business ranks #9 among The Best Online Master's in Finance Degree Programs! The Manning School of Business at the University of Massachusetts, Lowell, provides undergraduate and graduate students with numerous program options through five departments representing diverse fields, including Accounting, Management, Marketing, Operations and Information Systems, and Finance. Students benefit from access to internship and scholarship opportunities, flexible and career-oriented programs, student organizations, and more. Through the Division of Online and Continuing Education, the Department of Finance provides an online Master of Science in Finance degree program which prepares students to pursue a variety of career paths in finance. The program emphasizes fundamental aspects of professional financial practice, including financial analysis, portfolio management, securities analysis, risk and return assessment, and corporate finance. Students enhance their ability to successfully engage in positions in professions such as portfolio management, investment banking, securities analysis, hedge funds, and more. The University of Massachusetts, Lowell, is accredited by the New England Association of Schools and Colleges (NEASC). The Manning School of Business is accredited by the Association to Advance Collegiate Schools of Business (AACSB). Saint Joseph's University – Haub School of Business ranks #10 among The Best Online Master's in Finance Degree Programs! The Department of Finance at Saint Joseph's University provides students with a variety of undergraduate and graduate options for study of finance and financial fields. Housed in the Haub School of Business, students in the Department of Finance's programs benefit from access to co-op, internship, and study abroad opportunities, scholarships, service learning options, and a partnership with the Washington Center for Internships and Academic Seminars. The Department of Finance's Master of Science in Financial Services online degree program has accreditation from the Association to Advance Collegiate Schools of Business (AACSB) and certification from the Certified Financial Planner Board of Standards (CFP). The program develops a thorough foundation of knowledge covering key aspects of finance professions, including financial analysis, corporate finance, securities analysis, investment banking, financial planning, risk management, and insurance. Students in the program prepare to pursue a variety of financial careers in diverse professional settings. Creighton University – Heider College of Business ranks #11 among The Best Online Master's in Finance Degree Programs! The Heider College of Business provides undergraduate and graduate students, traditional and non-traditional, with plenty of options for study covering numerous fields in business. Committed to advancing the Jesuit values of Creighton University, the Heider College of Business builds its programs around the University's core values of professional education, service learning, community service, faculty/staff outreach, and community resource. Heider College of Business students benefit from internship and scholarship opportunities as well as access to outreach initiatives and research centers. The Heider College of Business offers an online Master of Finance degree program that prepares students to pursue a variety of careers in finance. Students develop key professional knowledge and skills built on a balanced foundation that includes depth and specificity in practical professional applications. The program engages students in coursework which covers equity analysis, portfolio management, quantitative analysis, analytical and critical thinking, managerial finance, and more. Students enhance their ability to act as leaders in numerous professional roles, including as accountants, auditors, credit analysts, investment managers, and more. Creighton University is accredited by the Higher Learning Commission (HLC). The Heider College of Business is accredited by the Association to Advance Collegiate Schools of Business (AACSB). University of Colorado Denver Business School ranks #12 among The Best Online Master's in Finance Degree Programs! The University of Colorado Denver Business School provides students with a wide variety of program options. With internship, study abroad, and scholarship opportunities, as well as student organizations, events, and career development, students are set up for success. The CU Denver Business School also engages in industry partnerships and programs and offers Centers and initiatives such as the J.P. Morgan Center for Commodities, the first center of its kind, providing students unique opportunities for experience and growth. The CU Denver Business School offers an online Master of Science in Finance and Risk Management degree with a specialization in Finance. Students are prepared to either pursue or advance financial careers in a variety of professional settings, including investment banking, asset management, corporate banking, insurance, and more. The program emphasizes fundamental aspects of the financial field, including financial management theories and practice, macroeconomics and market evaluation, investment management analysis, and risk management and analysis. The University of Colorado Denver is accredited by the Higher Learning Commission (HLC). The CU Denver Business School is accredited by the Association to Advance Collegiate Schools of Business (AACSB). Colorado State University Global Campus ranks #13 among The Best Online Master's in Finance Degree Programs! Making up half of Colorado State University Global Campus, the School of Management and Innovation offers a variety of online undergraduate and graduate programs. As part of the online campus of the Colorado State University System, the School of Management and Innovation meets the educational needs of working and non-traditional students though flexible programs. The School provides students with the education and resources necessary to advance in their personal and professional lives. The School of Management and Innovation offers an online Master in Finance degree program with 15 options for specialization, including Accounting, Criminal Justice Leadership, Fraud Management, Information Technology, and Project Management among them. Regardless of the specialization chosen, students develop a strong foundation in key practical and theoretical approaches to finance. Students engage in financial fundamentals, including corporate finance, investment, risk management, and more. The program prepares students to pursue or advance financial careers in a diverse array of fields and professional settings, with general or niche applications. Students must complete a capstone project. Colorado State University Global Campus is accredited by the Higher Learning Commission (HLC). University of Michigan, Dearborn ranks #14 among The Best Online Master's in Finance Degree Programs! Providing a wide variety of undergraduate and graduate programs of study, the College of Business at the University of Michigan, Dearborn, meets the needs of a large, diverse student body. Internship, study abroad, and scholarship opportunities, as well as professional student organizations, provide students with career-advancing benefits. On-campus centers and institutes, such as the Business Experiential Learning Lab, offer unique educational and experiential opportunities. The College of Business offers an online Master of Science in Finance degree program with two concentration options, in Corporate Finance and Investments. The program develops a balanced foundation of practical and theoretical approaches to financial management, covering fundamental areas such as economic analysis, statistical modeling, risk and reward assessment, data interpretation, and more. Students prepare to pursue or advance a variety of careers in professional finance, including investment banking, money management, commercial lending, and asset management. Students in the online program may complete an internship. Students can complete the online MS in Finance degree program in 12 months of full-time study. The University of Michigan, Dearborn, is accredited by the Higher Learning Commission (HLC). The College of Business is accredited by the Association to Advance Collegiate Schools of Business (AACSB). Pace University – Lubin School of Business ranks #15 among The Best Online Master's in Finance Degree Programs! Part of the Lubin School of Business at Pace University, the Department of Finance and Economics provides undergraduate and graduate program options for a diverse body of students in financial fields. With numerous internship opportunities, scholarship options, student organizations and events, access to Centers in the School such as the Global Portfolio Analysis Center, and special programs that cater to the specific needs of working students, the Department offers students plenty of benefits to promote their professional development. The Department of Finance and Economics offers an online Master in Finance for Professionals degree program designed to meet the needs of busy students already working in finance professions; the Department of Finance and Economics recommends students should have at least three years of professional experience. Students develop knowledge and skills, gaining an understanding of the field within a practical framework through building on exiting knowledge and experience. Students can complete the online Master in Finance for Professionals degree program in 12 months. The program requires students to attend six weekend residencies, roughly eight weeks apart. Pace University is accredited by the Middle States Commission on Higher Education (MSCHE). The Lubin School of Business is accredited by the Association to Advance Collegiate Schools of Business (AACSB). University of Houston, Clear Lake – College of Business ranks #16 among The Best Online Master's in Finance Degree Programs! The Colleges of Business at the University of Houston, Clear Lake, offers undergraduate and graduate programs across five diverse departments, including the Department of Decision Sciences, Economics, Finance, and Marketing. Focused on developing tomorrow's leading professionals, the College of Business provides plenty of online educational opportunities to meet the needs of busy, non-traditional students. Through internship opportunities, flexible study options, career development services, and unique program options, the College of Business helps students grow and advance personally and professionally. The Department of Decision Sciences, Economics, Finance, and Marketing offers an online Master of Science in Finance degree program with an optional concentration in Healthcare Administration. The program utilizes a focused approach to the theoretical and practical skills and knowledge necessary to success in financial professions. Students engage in financial fundamentals, including risk and return evaluation, financial assessment and planning, corporate finance, investment management, and more. Students in the program prepare to pursue or advance careers in various professional areas, including corporate finance, commercial banking, financial planning, investment banking, money management, and real estate investment. Students in the program must complete a capstone project. Students may additionally complete an internship. With two courses taken per semester, students can complete the online MS in Finance degree program in 18 months. The University of Houston, Clear Lake, is accredited by the Southern Association of Colleges and Schools Commission on Colleges (SACSCOC). The College of Business is accredited by the Association to Advance Collegiate Schools of Business (AACSB). Webster University – Walker School of Business and Technology ranks #17 among The Best Online Master's in Finance Degree Programs! Housed at Webster University, the Walker School of Business and Technology provides students with undergraduate and graduate programs of study across numerous business fields. With a healthy selection of on-campus and online program options, the School meets the needs of traditional and non-traditional students. Emphasizing a blend of the latest theory with proven, practical approaches to business, the School seeks to prepare students for success in diverse career paths. The Walker School of Business and Technology's online Master of Science in Finance degree program prepares students to pursue a variety of financial careers. The program blends key aspects of finance, accounting, and economics to develop a well-rounded foundation of knowledge and skills. Students in the online MS in Finance degree program engage in coursework that covers investments, financial markets, economic analysis, corporate finance, and more, blending practical and theoretical approaches to finance. Students develop the ability to perform risk analysis and assessment, financial planning, investment banking, and more. Students may also pursue a dual degree MBA/MS in finance option. Webster University is accredited by the Higher Learning Commission (HLC). Southern New Hampshire University ranks #18 among The Best Online Master's in Finance Degree Programs! The College of Online and Continuing Education at Southern New Hampshire University provides non-traditional students with over 200 career-focused degree program options at all levels of experience. With plenty of options for study, career development services, internship opportunities, and more, the College meets the unique educational and professional needs of non-traditional students from diverse backgrounds. The College of Online and Continuing Education offers an online Master of Science in Finance degree program with options to pursue a general concentration, as well as a concentration in Corporate Finance, or in Investments and Securities. The program develops a thorough foundation of knowledge covering key areas, including financial analysis, corporate finance, commercial banking, securities analysis, investment banking, financial planning, risk management, and insurance. Students prepare to pursue a variety of financial careers in diverse professional settings. Students can complete the online MSF degree program in as few as 15 months, with two courses taken per each 10-week term. The courses utilize an asynchronous delivery model. Southern New Hampshire University is accredited by the New England Association of Schools and Colleges (NEASC). Golden Gate University – Ageno School of Business ranks #19 among The Best Online Master's in Finance Degree Programs! Offering undergraduate and graduate programs, the Ageno School of Business at Golden Gate University meets the needs of a diverse body of students. With numerous programs available 100-percent online, the School of Business can serve full-time students as well as busy, non-traditional students who seek to advance their careers through flexible graduate education. The Ageno School of Business offers a Master of Science in Finance online degree program with three concentration options, including: General Finance; Corporate Finance; and Investment Management. The program utilizes a specific, focused approach to the study of finance in business to prepare students for specialized financial careers. Students develop a strong foundation of knowledge in key aspects of financial professions, as well as advanced knowledge and skills in niche concentration areas. The Master in Finance online degree program emphasizes fundamental aspects of the field, including investment research and evaluation, security valuation, and assessing risk and return. Students prepare to pursue careers as financial managers, security analysts, corporate bankers, portfolio managers, and more. Golden Gate University is accredited by the WASC Senior College and University Commission (WSCUC). New England College of Business ranks #20 among The Best Online Master's in Finance Degree Programs! Founded in 1909, the private, for-profit New England College of Business offers degree and non-degree programs at all levels, covering a wide variety of niche and general areas of study in business. The College's numerous online programs meet the unique needs of busy, career-focused students, who benefit from internship opportunities, corporate sponsorships, career development services, and more. The New England College of Business offers an online Master of Science in Finance degree program with an optional concentration in Global Finance Trading. Students prepare to pursue or advance financial careers in a variety of professional settings, including asset management, hedge funds, insurance, commercial lending, investment banking, and more. Students develop a balanced foundation of knowledge and skills necessary to success in financial professions. The program engages students with financial fundamentals, including investment management theory and practice, national and international finance, financial modeling, and more. The Global Finance Trading concentration options allows for unique specialization. Students in the online Master of Science in Finance program must also complete a capstone project. Students can complete the program in 15 months with continuous enrollment. The New England College of Business is accredited by the New England Association of Schools and Colleges (NEASC). According to the Bureau of Labor Statistics, the projected job growth outlook from 2016--2026 for Financial Analysts currently sits at 11 percent. For the same period of time, the job growth outlook for Financial Managers sits at 19 percent. Masters in Finance and MBA in Finance programs exhibit some key differences, making a Masters in Finance right for some individuals, but an MBA in Finance right for others. Both provide the graduate education necessary to pursue a variety of lucrative professions in finance. However, a Masters in Finance provides more specialization than an MBA. A Masters in Finance dedicates the entire program to the study of finance, and delves into niche knowledge, skills, and approaches to success in finance professions. An MBA in Finance provides some specialized focus in finance, but presents a larger and more general approach to the study of business administration, emphasizing managerial practices, organizational management, and other related concepts. Association for Financial Professionals (AFP) – Founded in 1980, the AFP maintains industry standards through the Certified Treasury Professional and Certified Corporate FP&A Professional certification programs. With an international membership community, and large international conferences, AFP members gain access to a huge professional network. Members benefit from conferences and events, career training and development services, and access to publications and data. International Financial Management Association (IFMA) – With a large international membership community, the IFMA offers valuable networking opportunities for financial professionals in diverse fields and settings. Membership includes access to large networking and educational events, publications and resources, and the IFMA seal of quality. The National Association of Personal Financial Advisors (NAPFA) – Founded in 1983 by industry professional seeking to better serve their clients, the NAPFA maintains high industry standards through an established code of ethics that members must adhere to. Membership includes the benefits of networking and educational events, publications and resources, industry discounts and connections, and unique opportunities for students.